Cauldron Keeper is an epic Willpower creature card. It is part of the Heroes of Skyrim expansion. "I sell cures for all ills." "They'll be needing a poultice." This card's summon ability applies the Double Toil card effect. 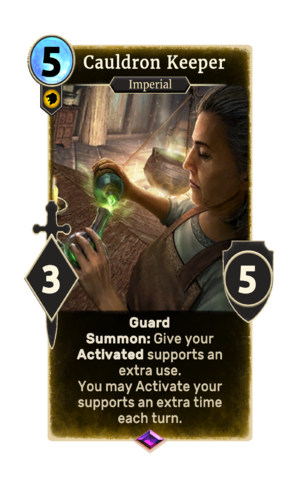 The card depicts Arcadia from Skyrim, who owns Arcadia's Cauldron. Similarly, she often utters "I sell cures for all ills, and I'll be happy to serve you." This card, in conjunction with Goldbrand, can be used to get The Golden title. This page was last modified on 27 February 2019, at 19:46.